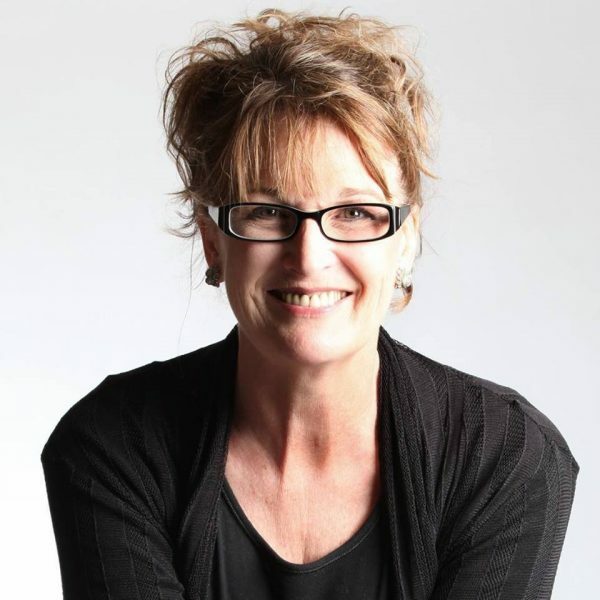 Author Karenlee Thompson, currently based in Queensland, will be back in Tasmanian this month to launch her new short story collection Flame Tip (Hybrid Publishers) at Fullers Bookshop in Hobart. Flame Tip is a collection of short fictions that explore different realities and perceptions arising from the Tasmanian Black Tuesday bushfires. The pieces in this collection are as diverse in subject matter (infidelity, love, suicide) as they are in length. Despite the horror of one day of infernal terror, these stories reveal nuances of character and place through resilience, empathy, honesty and humour. 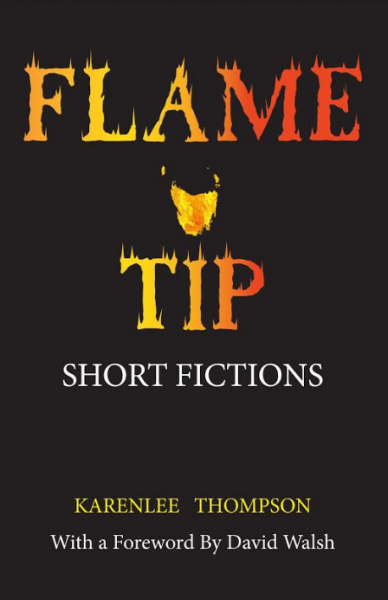 We have one copy of Flame Tip to give away – to be in with a chance of winning, email ruth@taswriters.org by noon on Wednesday 22 March. We are delighted that Karenlee was able to take some time to chat to us in advance of the launch. Congratulations on the publication of Flame Tip, Karenlee! Can you tell us a bit about the book in your own words? Thank you. I am very proud of this collection of short fictions. The stories are all tenuously linked by the Black Tuesday bushfires. Some of them take on the theme quite literally while others have merely a hint of the fires in them (just the ash, if you like). The collection has allowed me to showcase a number of different styles in the short form. Can you tell us about the process of writing and publishing the book – from the initial idea to the recent launch? I was writing a short story destined for the Tasmanian Writers Prize (‘Jack Frost’, which was subsequently shortlisted) and the couple in the story get together during the bushfires – I can’t even remember why now. I guess that sparked a few vague ideas and I went off on a tangent and wrote a couple more stories before returning to the original one. At some point, it twigged that 2017 would be the 50th anniversary of the bushfires, sparking the idea for a collection. I was absolutely thrilled when Hybrid Publishers offered me a contract and committed to publishing early this year. They have been a dream to work with through the whole process. The official launch will be held at Fullers Bookshop on Thursday 23rd March and I am thrilled that the talented Tasmanian-based author Katherine Johnson has agreed to host the Q&A session. She has received well-deserved praise for her novels Pescador’s Wake and The Better Son. I’ll also be available for signing at The Hobart Bookshop on Saturday 25th March when the markets are on (I love Salamanca!) and I’m looking forward to a quick trip up to Launceston on Wednesday 29th March to sign some books at Petrarch’s (I don’t get to Launceston very often so I do hope readers will pop in to say hi). Does your work tend to involve a lot of research? Sometimes it does and I do tend to get bogged down at times. Like most people, the internet is my first port of call (I marvel sometimes at what writers achieved without it! ), usually followed by emails and phone calls and days buried in library archives. Some of the stories in the collection required virtually no research, others came from a research base. One of the stories – ‘Medusa One Snake and her Band of Three’ – was inspired by an article I stumbled across about research being undertaken by journalist and ornithologist Bob Gosford into the deliberate spreading of fire by birds. How did the foreword by David Walsh happen? Well that was fun. When the collection was almost complete and I was looking for a way to make publication happen, I decided to write what I thought was a pretty funny letter to David. He’s a bit of a hero in my book and I thought I’d just see if there was anything he could do to help me out. He seemed to get my sense of humour and liked my work and, when he agreed to write the Foreword, I was absolutely thrilled. We’ve corresponded a bit over the past six months but have still never met in person. Every time I come home to Tassie, I pay a visit to Mona and – strangely – I’ve spotted David every time. I believe he will be away when I’m in town this time which is a shame. But there you go, the mystery continues. You know what else? During this process, he asked me to write something for him – for a project he and his wife Kirsha Kaechele were working on – and I wrote something he was happy with. He responded by email with a one-word sentence: ‘exquisite’. I kinda want to get that framed. Since you’re now published across several genres, how would you say that writing short stories compares to writing a novel or poetry? Writing a novel is tough. When I write, I tend to go deep into my characters’ lives and so it is extremely difficult to haul oneself out into the real world – job, family, all that. I am a slow writer and I’ve been known to spend a whole day perfecting one sentence so it takes a long time for me to have a polished novel ready for submission. Poetry can be quite agonizing for me. My best poetry comes when I least expect it and, usually, when I have plenty of solitary free time. I would never make a full-time Poet as I can’t just sit down and write it like I can other forms. The short story is where I feel most at home but it has taken me a while to understand that. I have always enjoyed reading short stories but I’ve just been a bit slow to fully embrace the form as my happy place. How does Queensland compare to Tasmania as a place to be a writer – is there a supportive community? Tasmania’s literary scene is really thriving, isn’t it? I’m only just getting to know people but I am blown away by the supportive nature. Generally speaking, I think there can be a bit of elitism in the literary scene but I don’t detect that in Tasmania. There is an inclusiveness and a willingness to help – I have noticed it in many ways: my dealings with the staff of the Tasmanian Writers Centre, phone conversations with booksellers, chats with library staff, responses from other writers. It is so refreshing. Do you think there is anything distinctive about Tasmanian writing? There is a romance and intrigue that comes with island life I think. So often, I can read the landscape between the lines of Tasmanian works. Its distinctive geography is usually evident, sometimes in subtle ways. And the history. Even in contemporary works, the history bubbles beneath the surface. What about Australian writing more generally? I like the fact that Australian literature seems very fluid, constantly moving forward as our culture morphs. I love reading the Australian voice – as ever-changing as that may be – and, in these days of mass US pop culture, I think it is important to nurture Australian writing. Literature is like a reflection and I like to see our sense of humour and irreverence shine. Why do you think there hasn’t been more writing about Black Tuesday? That’s a very interesting question. A lot of people know absolutely nothing about the Tasmanian Black Tuesday fires. It was before mass media saturation, well before internet coverage and FB updates and all that. So it is something that is not on the radar of many people. Amongst people that do remember and those who may have studied the fires, there is a kind of reverence perhaps that pushes fiction outside the frame. I used a fair bit of humour in some of the stories – I think it is the Aussie way to find something to laugh about. Can you share anything with us about your next project? It will be short stories for the foreseeable future and I can see the arc of an anthology forming. Details of the Hobart Flame Tip launch are here. Karenlee will also be doing an event at Petrarch’s in Launceston on 29 March. Details on that are here. Karenlee’s website is available at: https://karenleethompson.wordpress.com.